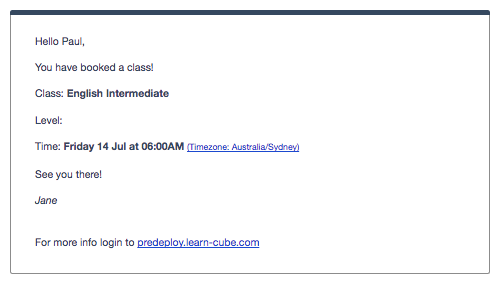 The LearnCube Online School Software takes all the pain out of scheduling classes with students. Firstly, it's easy to schedule 1:1 private classes and small group classes. Once a student has enrolled in a class. 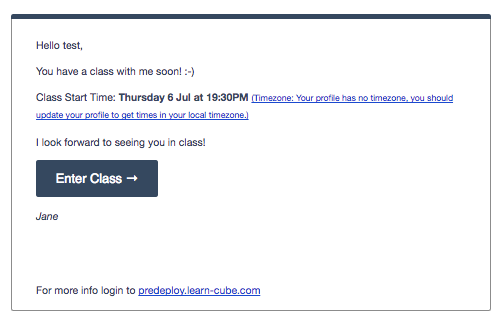 ...and a reminder email 2 hours before the class starts. You'll notice there's a hyperlink so a student can quickly add to their calendar. The teacher will also receive a class confirmation. 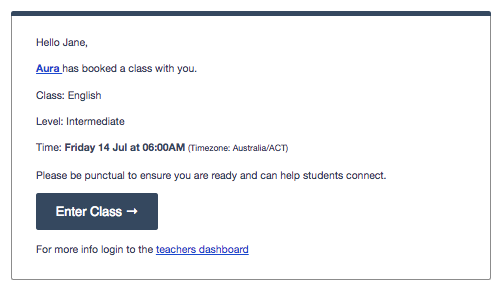 A student can cancel their class anytime before 24 hours before the class starts by default. This can be changed as an option. If a student cancels, their teacher will receive an email notification. If a student cancels a class within 24 hours of starting, a class token will still be taken because it's not fair that you're out of pocket for last minute changes.